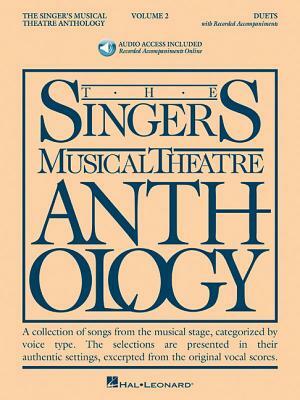 The Singer's Musical Theatre Anthology, Volume 2: Duets [With 2 CDs] (Paperback) | The Drama Book Shop, Inc.
(Vocal Collection). The world's most trusted source for great theatre literature for singing actors. The online audio files include piano accompaniments. The book features authentic editions of each song in the original keys. The songs have been carefully chosen for each voice type and are culled from a wide selection of classic and contemporary shows. Contents: AIDA: Elaborate Lives, Written in the Stars * ANNIE GET YOUR GUN: An Old Fashioned Wedding, Anything You Can Do * CABARET: It Couldn't Please Me More * CALL ME MADAM: (I Wonder Why?) You're Just in Love * CHESS: You and I * CHICAGO: Class * COMPANY: Barcelona * THE FANTASTICKS: They Were You * THE FULL MONTY: You Rule My World * FUNNY GIRL: You Are Woman, I Am Man * GIGI: I Remember It Well * GUYS AND DOLLS: I'll Know, Guys and Dolls, Sue Me * HAIRSPRAY: Timeless to Me * I LOVE YOU, YOU'RE PERFECT, NOW CHANGE: Marriage Tango * JEKYLL & HYDE: Take Me as I Am * THE LAST FIVE YEARS: The Next Ten Minutes * MAME: Bosom Buddies * MISS SAIGON: The Last Night of the World * THE PHANTOM OF THE OPERA: All I Ask of You * THE PRODUCERS: We Can Do It * SATURDAY NIGHT: I Remember That * SHOW BOAT: Why Do I Love You? * SIDE SHOW: Who Will Love Me As I Am? * SONGS FOR A NEW WORLD: I'd Give It All for You * MONTY PYTHON'S SPAMALOT: The Song That Goes Like This * VICTOR/VICTORIA: Almost a Love Song * WICKED: What Is This Feeling?